Deanna Lynn Sletten: 2016 Happy Holiday Giveaway! Win a $100 Amazon Gift Card and More! 2016 Happy Holiday Giveaway! 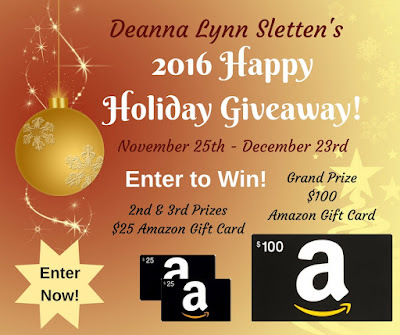 Win a $100 Amazon Gift Card and More! Thank you all for entering. Don't worry if you didn't win - I will have many more giveaways in the future. Update:The contest is now over. Thank you to everyone who entered. I will announce the winners as soon as they have been notified. And what better way than to give away prizes? The 2016 Happy Holiday Giveaway! Use the Raffelcopter below to enter. United States, United Kingdom, and Canadian Residents are eligible to enter only. Prizes are in U.S. dollars or equivalent. Winners will be notified by email and be given 48 hours to respond. If a winner does not respond within that 48 hour time period, another winner will be drawn. No Exceptions. Merry Christmas! Hope you had a wonderful Thanksgiving with the family. I gave a kitcheAid mixer to a relative and the were ecstatic. The best Christmas gifts were some that I've given to my grandsons. They're 3 this year and the joy on their faces is priceless! I gave my mom a laptop last year and she wanted one so bad. A Kindle! Thank you for the giveaway. I gave my husband a race car experience where he got to go drive a real race car at Atlanta Motor Speedway. He loved it. I think the best gift was a needlepoint picture. They liked all of the hours I put into the gift. Peace and quiet. No complaining. No whining. No grief. One year I cleaned an elderly couples home because they were in such poor health, they hadn't been able to clean in a long time. The best Christmas gift I ever gave was myself. Making sure everyone got what they wanted and had a lovely Christmas. The best gift was Minnie Mouse to my granddaughter. She hugged it when she opened it. the best Christmas present I ever gave was to my Ex-Husband who was a hunter. It was a rifle that could shoot 2 different kinds of bullets.One Christmas when my Daughter was little gave her a motorized jeep and she loved it so much. My daughter Fiona to my family. The best Christmas gift I received was a cross stitched picture of my mother. My daughter made it for me a year after my mom passed,away. One Christmas I gave my sis a scrapbook that I made just for her. The best Christmas gift I can ever receive is seeing loved ones happy on Christmas! I think the best Christmas gift I ever gave someone would have to be gift card . The best gift I gave was to my sister. It was a ticket home for The holidays. I gave my Best Friend a bracelet with owls all over it and she loved it so. I gave my parents a trip to Ireland. My Mom's heritage. They loved it, and I loved doing it. I gave my Daughter a laptop ! I gave my children bicycles one year, and we all had a blast playing on Christmas day. I struggled to answer this question, then I remembered: Both of my kids have December birthdays. One is a doctor now, the other a teacher. Those are good Christmas gifts to give to the world. Oh I think it was a framed print that we gave my dad years ago with a picture of the old train station that his mother had before she passed away. We framed it for him, was so special and he loved it. The best gift I've given was a huge Harry Potter set up on the dining room table with all new toys for my daughter one year. She had just got into the books and was so excited. We even made a quidditch pitch. She still talks about it all the time as the best Christmas ever. My siblings and I had my mother's wedding ring reset, the setting had broken. My mother cried when she saw it and put it back on her finger. I don't think she ever took it back off. The best Christmas gift I ever gave was a portrait I drew of my parents. A trip to grandma's for Christmas. The best gift I ever gave anyone for Christmas was the birth of my daughter. I gave my mom a Holy clothing brand top, and it's still her favorite to this day, she loves it. I gave a kindle to my mom when they first came out and she was super excited. I gave an afghan to my mother and she loved it! The best Christmas gift I ever gave someone was bedding set that they were in need of. I even altered the bedskirt to fit their particular bed. The last Christmas gift I gave to my boyfriend was a cabelas gift card. THE BEST PRESENT WAS SOME ANTIQUE FISHING LURES,WHICH WAS A BEST PRESENT TO THE PERSON THEY WERE A PRESENT FOR. SHELLEY S.
This year I gave a boy in my community his very first bike! His reaction was truly priceless! Best gift was when my grandmother gave me a photo album of pictures of my mom growing up. I can't recall a real "homerun" when I gave a gift. I'm usually more successful with my sister or mother than male relatives/friends.